I love this Joovy Scooter stroller. I previous own a Joovy Caboose as I have two boys close in age-4 and 5 years old. The 5 year old just started school and now I was able to start running again. While the double stroller was fine for pushing two,it was not good for running. I decided to splurge and get a new stroller. After doing my research I decided on the Joovy Scooter. This stroller is very easy to run with and go on walks. When I run I just lock the front wheels so they don't swivel. My four year old has plenty of room in the stroller and loves that now mom can go fast. 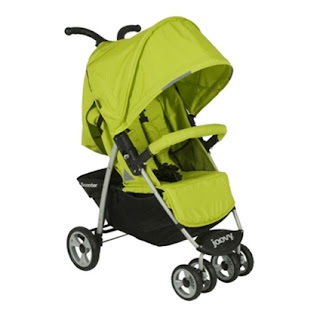 I love the big canopy on the stroller and the color is wonderful and bright. The fabric is stain proof as kids are messy. The basket is very big and there is a cup holder for mom. The stroller is very light weight and travels well. We took this stroller on two airplane trips with no problems. As I was saying earlier I am a runner. I don't like the bulkiness of running strollers and the Scooter handles like a running stroller without the bigness. The handle of the stroller makes running with the stroller a breeze. "these opinions are my own and I was not compensated for this review." New reader here, I really love your blog and your message! Before I became a mom, I used to do the same thing for my baby. It's just as wonderful as you imagine it being a great innovation. This stroller is very easy to run with and go on walks. When I run I just lock the front wheels so they don't swivel. The most important thing is Consider all stroller accessories, if you think you're going to need them or not.Your article is very helpful for choose the right stroller. Great article. I’m looking for double stroller and know that Uppababy will release a new one next month. Do you have any idea on it or general on uppababy, I’m so new with this branch. Looks amazing! I had a four-wheeled double stroller and I loved its maneuverability compared to our 3-wheeled jogging stroller. Love the sustainable materials. Wanting to buy a cradle swing for a very first grand baby. I have been looking at the fisher price Papsan and the my littlecradleswing. I don’t won’t one that is going to be noisy and I will like it to have a power adapter. Could you please help me choose the right one . Thank you. Wonderful products for baby, I love the stroller. It appears great, lightweight and small. I love this Joovy Scooter stroller, it very well and help me so much! Like stroller ,Baby bath tub,baby toys,Breastfeeding pillow,pacifiers, baby diapers etc are essential things for baby! love you my baby girl!! !